Prime Minister Modi warned that "forces of protectionism are raising their heads" against international trade and commerce. "Bilateral and multilateral trade negotiations have come to a kind of standstill," he said. He also praised his country's commitment to democracy and diversity. "For a society with diverse religions, cultures, languages, attires and cuisines, democracy is not just a political system but a way of living," he said, adding that inclusion is the "main principle" of his government. Is Modi living up to the ideals of globalization and diversity that he spoke of in his Davos speech? Let's compare these words to his government's actions. In December 2017, Modi's government imposed stiff tariffs on imports of cellphones, video cameras and televisions, according to a report in New York Times. The Indian government is also seriously considering a recommendation by Indian Directorate General of Safeguards, Customs and Central Excise that the country impose 70 percent tariffs on imported solar panels. Mr. Modi has pursued Hindutva politics and policies in spite of warnings by leading economists, including Ragu Rajan, Arun Shourie and analysts at Moody's. These have created a lot of fear among religious minorities and Dalits. But Mr. Modi has built his entire political career on the intense hatred of Muslims. US President Donald Trump built his successful presidential campaign on Islamophobia and xenophobia. That's what the two men have in common. India's largest state of Uttar Pradesh elected rabidly anti-Muslim chief minister Yogi Adiyanath who was hand-picked by Muslim-hating Prime Minister Narendra Modi in 2017. Just as white racists form the core of Trump's support base in America, the Modi phenomenon in India has been fueled by Hindu Nationalists whose leaders have praised Adolph Hitler for his hatred of Jews. "To keep up the purity of the Race and its culture, Germany shocked the world by her purging the country of the Semitic races -- the Jews. Race pride at its highest has been manifested here. Germany has also shown how well-nigh impossible it is for races and cultures, having differences going to the root, to be assimilated into one united whole, a good lesson for us in Hindusthan to learn and profit by." Indian Prime Minister Narendra Modi's actions do not match his rhetoric on globalization and commitment to diversity. His government's protectionist trade policies and treatment of minorities speak far louder than his words at the World Economic Forum Davos, Switzerland. In a career spanning more than four decades, economist Kaushik Basu has donned many hats. He was Chief Economic Adviser to the Government of India (2009-2012) and Chief Economist of the World Bank (2012-2016). At present, he is Professor of Economics and the C. Marks Professor of International Studies at Cornell University, U.S. He is also President of the International Economic Association for a three-year term (2017-2020). A prolific author, Mr. Basu explains why demonetisation was a bad idea and the need for the Goods and Services Tax (GST). You have been a vocal critic of demonetisation and its intended purpose. Do you think its immediate effects are behind us? And, conversely, if there are increased digital transactions and tax scrutiny, as claimed, will that eventually lead to more growth? I believe that demonetisation’s worst effects on the economy are behind us now. I do not think it will confer any long-run benefits in terms of digitalisation because that is a slow, natural process. There is no way that an emerging economy like India, with more than half the population still living in the informal sector, can leapfrog advanced economies and get there by a simple policy intervention. The main damage of demonetisation is to India’s reputation as a professionally run economy, since it was an uncalled-for jolt to the market. You have been a consistent supporter of the other major reform, the GST. Is the current multi-tiered GST design optimal, considering that much of the voiced distress comes from small businesses? The textile sector, for example. The GST was needed and I am glad that the government managed the political process to get it through. But it has been poorly implemented. For such a large policy shift, the planning and implementation design should have been much better. Also, it should not be too multi-tiered, which is both inconvenient and makes one wonder if this is a sign of sector-specific cronyism. Once we go past these teething troubles, the GST should aid efficiency and growth. Has the Narendra Modi government leveraged the historic mandate it received, in terms of economic policy? Is there scope for further reform, which could possibly be seen in the Union Budget to be presented soon? The broad policy continuity that we have seen in India — the GST, the effort to manage fiscal policy in ways similar to what happened before 2014 — is India’s strength. Yes, as always, a lot depends on the Budget, and we are all waiting to see what new initiatives are announced. But in fairness to the Ministry of Finance, India’s challenge is not a matter of fiscal policy alone. India’s economy is doing poorly on several fronts. Consider exports — they have dragged, with India’s trade deficit with China growing rapidly. Exports did seem to grow well from April to November last year, with an annual growth of 12.3%. But it was a time when several emerging economies did well and India’s performance fell short of many other nations, like Indonesia and Vietnam whose exports grew by 16% and 24%, respectively. I believe that India’s long-term prospects are very good, but to get out of the current morass, it needs a professionally designed combination of fiscal, monetary and international trade policy initiatives. Call it whatever you feel like but world will buy it. He (Modi) had a big act to follow; at the same conference last year, Chinese President Xi Jinping caught the attention of the world when he essentially sought to take up the mantle of global leadership that the U.S., under President Donald Trump, seemed to have carelessly discarded. Xi's speech was a bravura defense of globalization, not one whit less impressive for the fact that his regime is not precisely the sort of global leader that much of the world would wholeheartedly welcome. Modi, too, spoke of the fear that the tides of anti-globalization were rising, and that countries were becoming more "self-centered." But he didn't seem to be offering Indian leadership in response. Certainly, he correctly identified three worldwide problems -- climate change, terrorism and anti-globalization -- and committed India to the fight against them. But it wasn't clear what, concretely, India would do to persuade or win over waverers; how it would forge new alliances and blaze new trails to progress. This was particularly disappointing when, to Indian ears, much else in Modi's speech struck precisely the right note. Like all Indian leaders before him, he spoke of his country's diversity, of how democracy was its strength, of how it sought consensus and unity in politics at home and abroad. Modi's party and his government may consistently have fallen short of these goals, but there is some comfort to knowing that he too acknowledges that they lie at the heart of the Indian project. ... instead of going the whole way toward seeking to lead, Modi instead repeated tired tropes of India's defensive past diplomacy: condemnation of Pakistan's silly distinctions between "good" and "bad" Taliban, and reminders that the United Nations and the Bretton Woods institutions should create more space for India. The old India might bang on about representative institutions, but the India of this uncertain moment surely should seek to create new ones. Why worry about not being represented when you are the only one on the stage? That's when you seize the initiative. Tell us how the promotion of democracy and a commitment to diversity link up with India's re-imagination of the global order; tell us how connectivity and trade can be supported without the dangers inherent in Beijing's Belt and Road initiative, which is fueled by debt and promises; tell us how India's decades-long effort to give its Muslim citizens a stake in power has lessons for a world struggling with violent political Islamism. Perhaps the problem is that Modi's pitch fell between two stools. He wanted to both hard-sell India to his audience and to address the search for global solutions. Had India been growing at over 8 percent, its economy sound and his management unquestioned, he wouldn't have felt the need to waste much of his speech on the kind of public-relations blitz that many in the audience would've heard before. Although India's economy may be rebounding -- slightly and hesitantly -- after a self-inflicted slowdown, Modi's government is obviously still under-confident, still conscious of the need to push its growth story on the world. But Davos is more than just any investor conference, and the prime minister could have saved the "invest in India" pitch for the roundtable meetings with executives that he does so well. 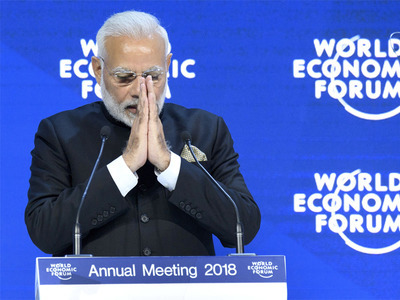 Davos didn't want India to sell itself to the world; it needed India to lead. So is the case with the fractures in Indian society. One of the key issues the Indian prime minister sought to highlight was that of terrorism. “As dangerous as terrorism is, the artificial distinction being made between good terrorist and bad terrorist is more dangerous,” Modi said. This assertion, perhaps pointing at Pakistan’s dilly-dallying with sections of the Taliban and Kashmir-focused militant groups, seems a little off in the Indian context, not the least under Modi’s watch. India, of course, is no stranger to religious or caste-based strife. However, since he took power in 2014, incidents of Hindu right-wing aggression, both online and offline, have gained momentum. Yet, the prime minister and senior leaders of his Bharatiya Janata Party (BJP) have mostly turned a blind eye towards those indulging in such violence—sometimes even tacitly backing them. The argument could also be extended to Modi’s claim of “inclusiveness” followed by his government. However, many would counter him on this front, too, not just on the basis of his government’s and colleagues’ public stances but also his own personal approach. In the Gujarat legislative elections late last year, for instance, his party used outright toxic rhetoric against non-Hindus and Dalits. And Modi, as prime minister, spearheaded such bigotry. In campaign mode, he hasn’t shied away from gaining electoral dividends by sharpening religious divides. At other times, when serious crimes were committed against non-Hindus, he chose a piercing silence. It is ironic then that the Nobel laureate himself would likely be branded an anti-national today—not the least by Modi’s own partymen. DAVOS, Switzerland (NYTIMES) - US President Donald Trump used the World Economic Forum meeting to woo investors and business leaders by reassuring them that "America first does not mean America alone". But it was clear in Davos, Switzerland, this past week that geopolitical momentum lay with Beijing, not Washington. At one end of town, President Michel Temer of Brazil welcomed an unexpected offer from Beijing for Latin American nations to work closely with a Chinese initiative, known as the Belt and Road, intended to spread its economic and diplomatic influence abroad. At the other end of town, a senior Chinese diplomat helped introduce the prime minister of Pakistan at a breakfast meeting. Prime Minister Shahid Khaqan Abbasi used his talk to praise the rapidly expanding Chinese investments in his country, including to build power stations and a large port. One of the best-attended speeches at the forum was that of Liu He, a member of China's ruling Politburo, who promoted the Belt and Road initiative, also known as One Belt, One Road. Participants here said the Chinese initiative was already rivaling more established, traditionally American-led, international institutions. "The China One Belt, One Road is going to be the new WTO - like it or not," said Joe Kaeser, chief executive of Siemens, the German industrial giant, referring to the World Trade Organisation. Belt and Road takes its name from the idea that Beijing is spreading its influence along the ancient Silk Road that once linked imperial China to the Roman Empire and to the medieval Europe of Marco Polo. But that was not the only push to extend its presence abroad that Beijing was trying to showcase. On Friday, the Chinese government used a policy document issued in Beijing to call for a "Polar Silk Road" that would link China to Europe and the Atlantic via a shipping route past the melting Arctic ice cap. Belt and Road has been a centrepiece of the foreign policy of President Xi Jinping, and his promises of a "China Dream" of restoring his nation to past greatness. Unveiled in Kazakhstan in 2013, Belt and Road started as a plan to revive economic, investment and diplomatic links across Central Asia. The plan gradually extended to include the Mideast, Europe and eastern Africa, with Beijing promising hundreds of billions of dollars of investment in highways, rail lines, ports, power stations and other infrastructure, much of it through loans from Chinese state-owned banks. Critics have been sceptical that projects bankrolled through the initiative will bury the recipients in debt and cause considerable environmental damage. It has also been criticised as an easy line of financing for authoritarian regimes. China says its projects will be environmentally and financially sound, and that it does not seek a say in how other countries are governed. While Davos was underway, China was making other efforts to stretch the geographical ambitions of its Belt and Road initiative even further. At a summit meeting for Latin American and Caribbean foreign ministers in Santiago, Chile, Foreign Minister Wang Yi of China called for close cooperation and participation by the region's countries, although he stopped short of formally including them in the initiative. In Davos, Temer of Brazil said that he was not concerned about the rising influence in South America of China, which has increased investments in his country and extended enormous loans to Venezuela and Ecuador. The RBI’s relentless high interest rates are killing the new entrepreneurial class and has forced India’s growth rate to fall below the average of the past 30 years. In an interview Kaushik Basu gave to The Hindu on January 24, the former chief economic adviser to the government of India pointed out that when all the recent massaging of India’s growth statistics is filtered out, India’s growth rate has now fallen below the average of the past 30 years. Quite obviously far from bringing back ‘achhe din’, Prime Minister Narendra Modi has taken the Indian economy back to something that is beginning to look dangerously like the “Hindu rate of growth” in a new saffron avatar. What is responsible for this? The short, blunt answer is the exorbitantly high interest rate regime imposed by the Reserve Bank of India almost eight years ago to curb a short spasm of inflation, which was then maintained relentlessly by a succession of its governors in the face of a pusillanimous finance minister irrespective of how much inflation has fallen. This has killed Indian industry. Today, the sum total of non-performing loans has reached the terrifying figure of Rs 9,50,000 crore, or $1.4 trillion. Worse still, Rs 1,140,000 crore of capital has been wasted on what the government euphemistically calls ’stalled’, but which are in reality abandoned projects. And worst of all, no fewer than 500 companies that had invested this money are now facing bankruptcy proceedings, and will have their remaining assets sold off at a fraction of their value in the next few years. Indian industry is dead. Demonetisation and the Goods and Services Tax (GST) have killed off a large part of the unorganised sector. This will gradually revive, but the RBI’s relentless high interest rates are killing the new entrepreneurial class that had come into being economic liberalisation in the 1990s and 2000s. Why is the RBI doing this? What model of banking is it aspiring to emulate? To understand this, it is necessary to understand the history of the RBI. A recent, racily written, book by well-known economic journalist TCA Srinivasaraghavan gives insights that help understand its motivation. TCA points out that banking grew out of the need of the rulers to finance war. This gave bankers an early ascendancy over the State that they misused for two centuries before the Wall Street crash of 1929. That, and the Great Recession that followed, forced the United States and European governments to create a lender of the last resort, i.e a central bank that would not only backstop, but also control, all other banks but itself be controlled by the government. Therein lay the rub. For governments were no less capable of abusing their power to create money than the banks that they set out to tame. This sowed the seeds of a conflict between central banks and governments that ended in Britain, with the Bank of England wresting full control of money supply from the treasury after the ‘Black Monday’ financial crash in 1992, but has still not ended in India. A compliant central bank might bolster the Indian prime minister’s reelection chances, but at the expense of the country’s long-term prospects. Many of us have long argued that, whatever its problems, India is one of the best long-term bets in the world for one simple reason: It has the sort of world-class institutions that can help build and sustain a genuine market economy. Sadly, many of those same institutions are being undermined by the country’s own leaders — most recently the Reserve Bank of India, which Prime Minister Narendra Modi appear intent on subjugating as part of his bid for reelection. Of all people, Modi should recognize that no election victory is worth giving up on India’s best chance at becoming a world-beating economy.